Right off the bat, you can see the Odor Gladiator™ is unique. There’s an atmosphere of fun around this company and I am very much in favor of fun. 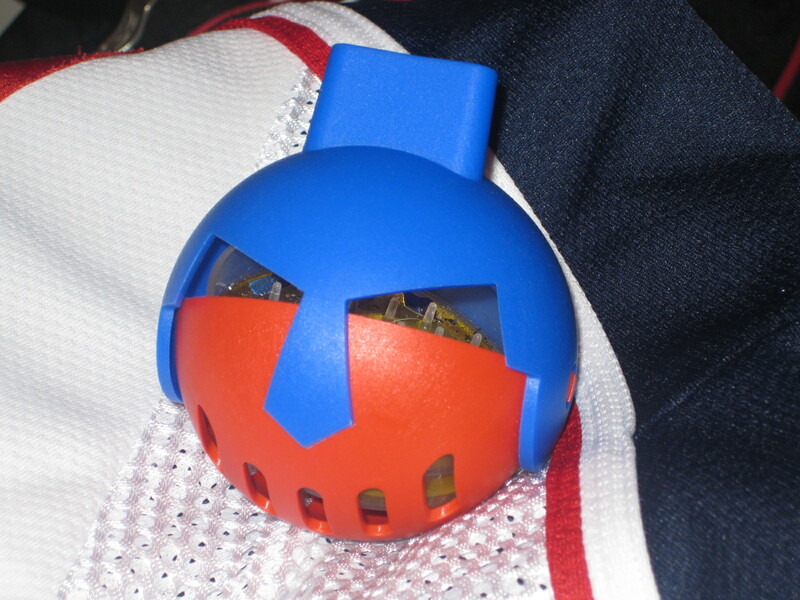 The Odor Gladiator ™ has a very cool, playful design resembling a Sparty helmet, and you can pick out your own color combination. We picked a blue and red combination to coordinate with the hockey jerseys. The Odor Gladiator™ is extremely durable, made out of a specially created polypropylene that houses a disc of pure sweet-smelling goodness containing Odor Neutralizer™. The disc, or Fresh Linen Shield, as Mike calls it, is what takes the stink out. Well, it actually functions by complexing specific organic molecules and reducing their concentration in the vapor phase. Got that? As I understand it, and I never took chemistry so I could be wrong, it changes the stink so your nose doesn’t smell it anymore. I can tell you that it definitely made an immediate impact. Our entire hockey locker room smelled better with the addition of just one Odor Gladiator™ in my son’s bag. After well over a month of testing, my son reports “I’ve got the best smelling bag of our whole team. By far.” Mike says the disc will last 45 days at least and we have found that to be true. Our disc is still going strong. One of the things that I like about this product is that it’s a toss-and-forget thing. You literally just insert the disc, snap it closed and toss it in the bag. No spraying, shaking powders, nothing. Another thing I like is that Odor Gladiator™ uses organic, non-toxic fragrance oils. There’s nothing gross or harmful, it won’t leak, doesn’t leave any dust or residue so I’m not worried about damaging expensive hockey equipment. Also, Odor Gladiator™ is made in the USA and purely entrepreneurial. I love supporting those kinds of companies. The Odor Gladiator™ costs $14.95 and includes a disc to get you started. A three-pack of Fresh Linen shields is $17.85. In my experience, that would be more than adequate to get you through the season and well worth the price. In addition to the equipment bags, I think you could find some other uses for the Odor Gladiator™. If you want to freshen up a room, stash an Odor Gladiator™ under the bed, or get one to match the décor of the room and put it on a shelf. Instead of one of those pine tree air fresheners, put an Odor Gladiator™ in the car. Keep one in the laundry room. Despite the durability of the Order Gladiator™, my son did manage to shear off one of the helmet posts. He has no idea how. I have no idea how. I didn’t think it was even possible! But as I explained to Mike, if something can be broken, we will do it. We have split bike helmets in two and cracked shin pads. The new eyeglasses were broken within 24 hours. My son broke his arm, then broke the cast. Twice! Now, our Odor Gladiator™ still worked fine but I let Mike know what happened. Sometimes you learn the most about a company when something goes wrong and what I learned here is that Mike Morneault will stop at nothing to make sure customers are satisfied. He immediately activated his customer service response team and we had a new Gladiator right away. I’m giving the Odor Gladiator™ a highly recommended rating for odor fighting, style and concept. It’s a great product and solves a big stinky problem. You don’t have to take my word for it. Daily Grommet has a piece on it, too. Here’s where you get a chance to win an Odor Gladiator™ of your very own. As Odor Gladiator™ is a recently launched company led by parents like us, we’d really like to help them get the word out. Simply “like” Odor Gladiator™ on its Facebook page! As a thanks for your effort, I will select three new fans from OG’s Facebook page on January 23 and present each with a customized Odor Gladiator™ in their choice of color! Wonderful review, Trophy Mom. Thank you, and thanks for investing the time to review Odor Gladiator! We couldn’t be more pleased with your experience and result! When the Midget hockey player notices his bag smells good, it’s a sign of a great product. We were pleased with the experience also! We’re Odor Gladiator users too. It’s made a huge difference, especially on days when we’re leaving the rink and going straight to other commitments. I’ve opened the Kid’s bag hours after practice or a game and it actually smells good. My son, his bag and my car really appreciate that warrior! 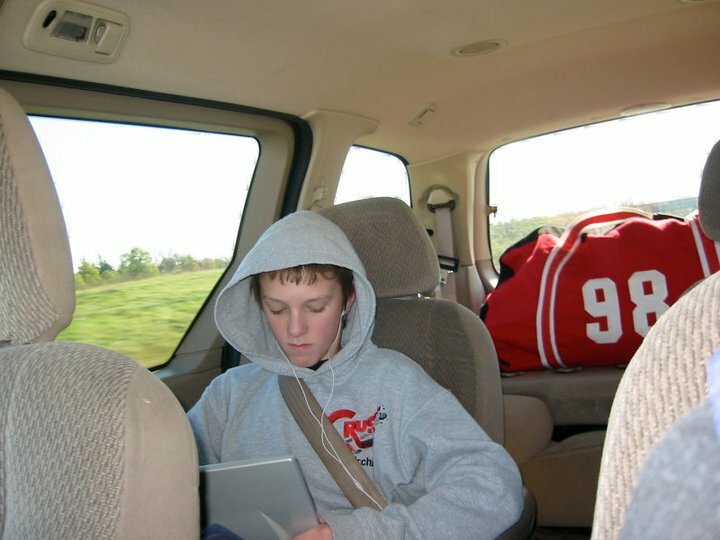 I was always afraid to leave the bag in the car for any extended time period because the whole car would stink. But, as you’ve said, the Odor Gladiator takes care of it. I’m thinking now, like the stick of gum offered to the person who needs to freshen their breath, maybe a gift of the Odor Gladiator to some particularly smelly teammates. Don’t forget to like the Odor Gladiator Facebook page for a chance to win. This would be great for a gym locker! Is it possible to hang one of these aroung my son’s neck? I’ve considered that! Did you like the Odor Gladiator Facebook page? You could win an Odor Gladiator and try that idea out. That’s pretty funny, Pam. Last summer at the Tri-State lax tourney we received a number of similar comments from disgusted Mom’s accompanied by stinky sons. I suppose we could drop a string through the OG and create a cool pendant of sorts. It would certainly be a funny addition to our Wordless Wednesday collection! http://odorgladiator.com/blog/?p=253 Perhaps your son will model the look and we can feature him on an upcoming blog post 🙂 On a serious note, we hope you’ll give OG a whirl. If you’re not entirely satisfied with its performance, we’ll gladly provide you a full refund. Cheers! My basketball boys could use this. It would be a great addition to the basketball bag or gym locker. Make sure you “like” the Odor Gladiator Facebook page so you get a chance to win one. No question. And we’d love to count you and your sons among our courtside fans. Ed Adamowicz: My daughter and boyfriend finally put their odor gladiators in their basketball bags! Thank goodness! They love them! Odor Gladiator: Thanks for the feedback, Ed! We’re excited to provide relief to basketball parents (and athletes) in Tennessee! Ed Adamowicz: I appreciate the relief believe me! Especially on long rides home!